However, regular retailers will not be permitted to sell anything with even a picture of a cannabis leaf on it – whether it’s clothing, décor, or smoking accessories. Smoking accessory stores in Montreal follow strict government rules regulating the sale of tobacco and related products – rules that some customers don’t understand. “It’s very difficult for us to explain to them the things that are controlling us,” said Christopher Mennillo, Vice-President of Prohibition, a chain of smoke stores. On October 17th, a new set of regulations will kick in. One provision states, in part, that logos, designs, or images can’t be used on cannabis-related objects that aren’t government-approved. For example, regular retailers will not be permitted to sell t-shirts imprinted with an image of a cannabis leaf. 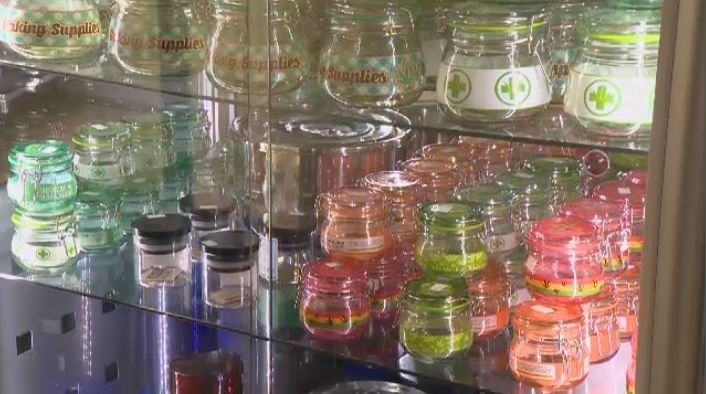 “Imagine a consumer walking in with an innocent purchase in mind – just wants to buy a cannabis t-shirt – and lo and behold, the one place he expects it to be, it won’t be there,” Mennillo added. The regulation won’t just affect clothing. All the cannabis leaf-decorated containers, posters, lighters, and board games will have to be taken off the shelves. Lawyer Mylany David says this aspect of Quebec law is confusing. First, because the Federal legislation is different, focusing more narrowly on advertising restrictions for cannabis producers – much like restrictions on tobacco advertising. “You cannot use your branding or your name into a public event, or a stadium, or building, or be associated with any activity in the public life,” David said. The Quebec version is broader, and is meant to prevent the normalization of cannabis use. But David says she expects it will face court challenges. The Health Ministry says they will be enforcing the regulations through the use of 31 inspectors. Retailers can face pretty hefty fines – from $5,000 to $62,500. Those amounts could be doubled upon second offense. Despite his dismay, Mennillo says his stores will obey the law. “All we can do is keep our ear to the ground and stay in touch with the lawyers,” he said.